Some people might wonder why I read a children's book, The Twelve Days of Christmas in Canada. When I saw Teena reading it, I had a good chuckle. Then Teena asked about something she had just read in it. Was Saskatoon Berries named after the city, or was the city named after the berries? Hmm. I guessed wrong. Seems the city was named after the berry. Shows you can learn new facts from anywhere. So I sat down today and gave it a read. O Canada, in Christmastime! 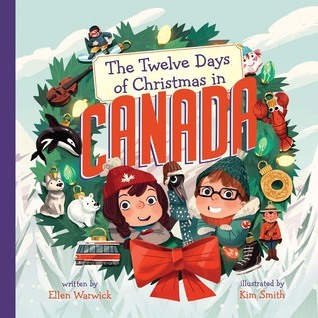 Come with Juliette and her "crazy Canuck cousin" as they take a holiday trip across the country, all the way from Prince Edward Island and vieux Québec to Winnipeg and Vancouver. Along the way Juliette gets really cool Canadian gifts—like 8 bears a-swimming, 6 Mounties marching, and a loon in a maple tree! Theo is Juliette's Canadian cousin, actually he calls himself her crazy Canuck cousin, who takes Juliette on an adventure across Canada. Accompanied by a loon named Maple, they travel by car, motorcycle, train, plan and even dog sled, seeing the sights and learning facts along the way. Yes, I admit that I learned some facts about Canada during their trip. The final part of the trip are some fun facts about Canada, such as Canada has over three million fresh water lakes, which is about 60% of the worlds lakes, and that the eastern white cedar is the slowest growing tree in the world, usually live to 200 years old, with some having lived for more than 1300 years. It's a fun book to give to a child for Christmas.